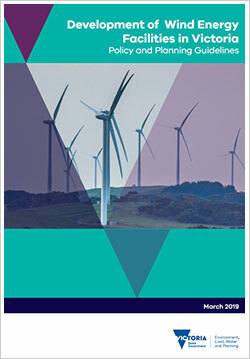 Amendment VC149 (gazetted 4 October 2018) changes the Victoria Planning Provisions and all planning schemes to mandate statutory environmental audits of noise assessments at both the pre and post-construction stages of a wind energy facility development, in accordance with the recommendations of the Independent Inquiry into the Environment Protection Authority. The policy and planning guidelines for development of wind energy facilities in Victoria have been updated to include changes introduced by the amendments listed above. Model planning permit conditions for wind energy facilities have been developed to assist all parties involved in permit applications. They are provided in Appendix B of the Policy and planning guidelines for wind energy facilities in Victoria (DOC, 260.5 KB). The conditions are for guidance only and should be adapted depending on the individual circumstance of each wind energy proposal. Information relevant to native vegetation requirements can be found on the Native vegetation page. Information for calculating the greenhouse benefits of wind energy development, and other helpful links and resources are provided below. Includes responsibility for agriculture, energy, resources, economic development, employment and innovation. A Victorian Government agency, established to accelerate sustainable resource supply and use across the Victorian economy. Their website includes information on a range of sustainability measures including wind and renewable energy. Administers legislation that protects Aboriginal cultural heritage. Potential impacts of a wind energy facility on Aboriginal cultural values must be considered in the early planning stages of a development. Wind Farm Industry Policy Statement (Commonwealth Department of Environment) assists wind farm operators to decide if proposed actions require assessment and approval under the Environment Protection and Biodiversity Conservation Act 1999.